Problem is when I scroll, this happens, and not on position 0... Looks like position 6 and position 8, plus it puts two in position 8. Now I am still trying to get the hang of using ListView and GridView so I do not understand why this is happening. One of the main reasons I am making this question is to help others who probably don't know about ListView and GridView's recycling View, or the way this article puts it, ScrapView mechanism. Adding link to a google IO talk that is basically all you need to understand how ListView works. Link was dead in on of the comments. So user3427079 was nice enough to update that link. Here it is for easy access. you will notice in your logcat initially convertview is null for all the visible rows, because initially there were no view(item) in recycler, so your getView() creates each new view for the visible items, but the moment you scroll up your item 1 will send to the Recycler with it state(for example the TextView text and as in mine case if checkbox is checked it will also be associated with the view and store in recycler). Now when you scroll up/down your listview is not going to create a new view it will use the view(convert view) which is already in your recycler, in your Logcat you will notice that convertView is not null, its because your new item 8 will be drawn using convertview, i.e., basically it take the item1 view from the recycler and inflater in place of item 8, and you can observe that as in mine code if you had a checkbox and if you check it at position 0(let say item1 has also a checkbox and you checked it) so when you scroll down you will see item 8 checkbox is already checked, this is why listview is re using the same view not creating a new for you due to performance optimization. 1. Never set the layout_height and layout_width of your listview to wrap_content as getView() will force your adapter to get some child for measuring the height of the views to be drawn in list view and can cause some unexpected behaviour like returning convertview even the list is not scrolled.always use match_parent or fixed width/height. Man, i understood the recycle method used by Android, but im getting this weird behaviour in my app. I have a Custom ArrayAdapter that has a getview method, the thing is that method is being called for different views if i scroll down and up, and this make this views load again (e.g. downloading an image). In my ListActivity class, i only call adapter = new Adapter... and list.setAdapter() , after i download and parse a json (im using AQuery library). In Facebook app and Instagram, you scroll up and down, and everything looks normal...why? @WitaloBenicio When ever you scroll up and down getview get called and most probably you are downloading images again. You should cache the images like other apps do. and before downloading any image check if its available in the cache then use it and if not then download it! Yeah yeah, in fact my problem, is that i was using AQuery library, and then passing it by reference to a asynchronous method. I fix it. Thanks you for the Image. 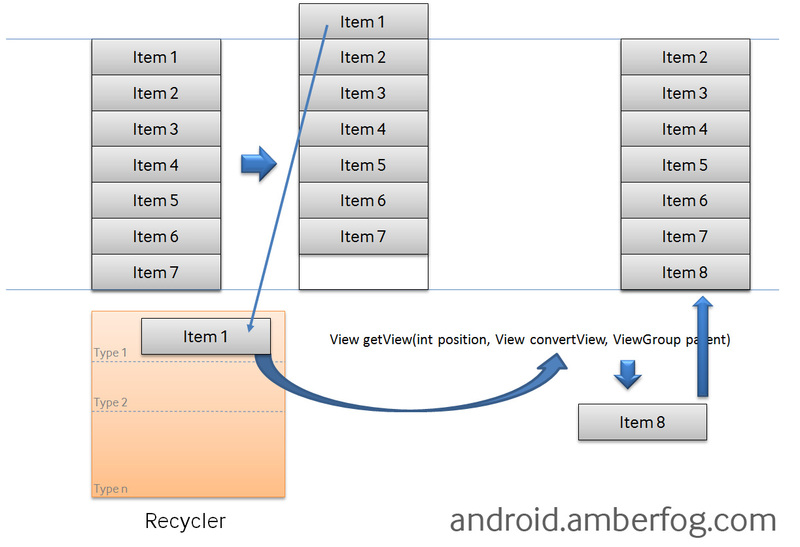 After having a lot of troubles with ListView when I started with Android, I already knew the recycling principle after struggling with it so much. Still, it took this picture and the sentence: if you had a checkbox and if you check it at position 0(let say item1 has also a checkbox and you checked it) so when you scroll down you will see item 8 checkbox is already checked,this is why listview is re using the same view not creating a new for you due to performance optimization. for me to realize my mistake. Best post about Android ListView recycling I came across! Can you tell me one thing if i want to change height of list row then why it only works by setting height dynamically(convertView.setLayoutParams(new AbsListView.LayoutParams(AbsListView.LayoutParams.FILL_PAREN‌​T,80));) and does not work by defining height of row in xml statically ? It should work. Can you show me your list_row xml? @MuhammadBabar I have problem like when i click on edittext inside of listview, the soft input keyboard changes numeric to alphabetic automatically. why its happens? @PratikButani this is strange. Can you show me your list item xml? and any related code that might be helpful. @MuhammadBabar awesome explaination man! It saves my time. Just want to know, does the RecyclerView also work on the same mechanism? In my question stackoverflow.com/questions/47897770/… , i know the task is quiet impossible with listView. Should I try with recyclerView? @Shambhu thanks, please check my comment there. Recycling of list view happens when you scroll down the screen and above list view items are hidden . They are reused to show new list view items. 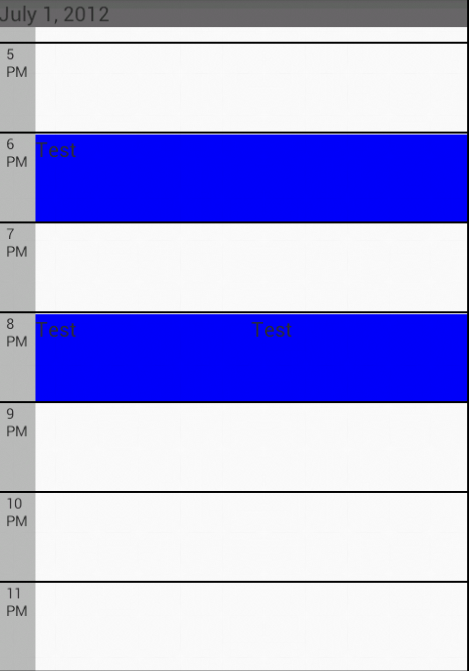 [SOLVED] How do I center text horizontally and vertically in a TextView? [SOLVED] Where should I set up click listeners when working with listview/gridview? [SOLVED] How to get the GridView position while its checkbox item is checked? [SOLVED] Recycling views in a listview, worth it?